This is a bad year for apples in our neighborhood. The Golden Delicious tree I usually pick from only produced a handful of apples at the highest branches (ten pounds at the most), and the tree with the red Jonagold-type fruit produced only about 100 apples, most of which the bees and worms got to first. I’ve picked maybe a dozen off of it for snacking; the rest were too far gone to so anything with. Another apple tree bore two apples, and the pear tree had nothing. But my friend Dekalb ran across a bountiful pear tree while working, and the owners were thrilled when he asked about picking from it. (They’d eaten their fill of pears, and didn’t want the rest to go to waste. 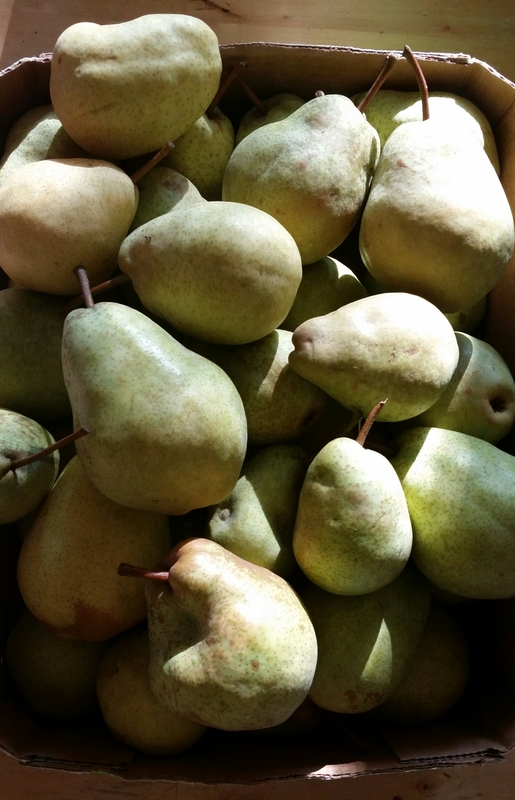 If you let your pears get overripe and drop to the ground, it’s bee city for you.) So one day I get a call, and a few minutes later Dekalb is marching through my door with box after box of pears. I think it totaled to a bushel and a half in all, though I never weighed them, so that’s going by sight. I spent Saturday night and most of Sunday slicing pears, poaching them, and then canning them with Season 8 of The X-Files playing the the background. I can my fruits under five pounds of pressure. Pressure canning isn’t required for most fruits, but I prefer it because it uses less water, which means the kitchen doesn’t turn into a sauna. I followed the USDA processing times for halved pears. I don’t like the cores to go to waste, so I cooked some and strained them to make pear sauce. When I got tired of that, I just started throwing them into jars for making fruit scrap vinegar. 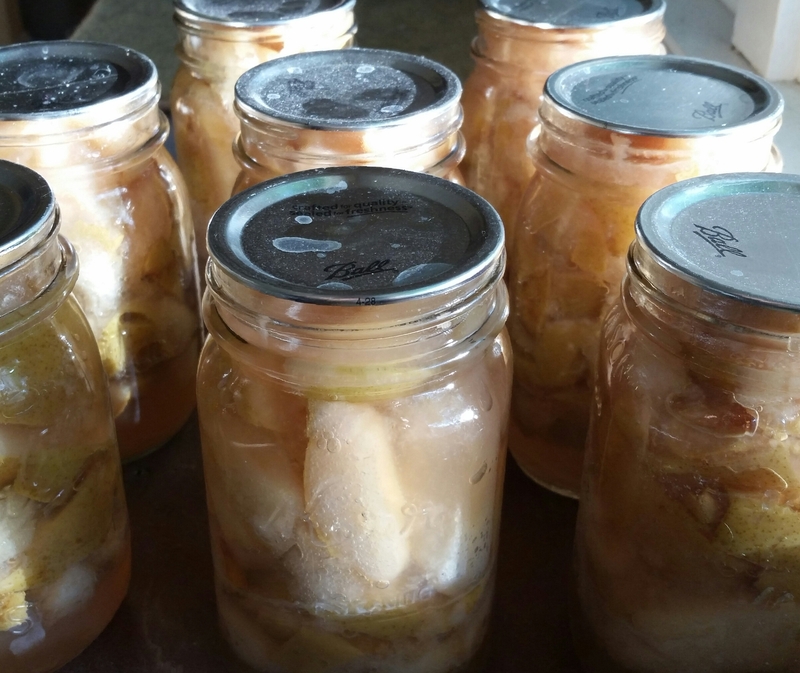 The tally: canned 35 pint jars of sliced pears (skin on), started five half-gallon jars of pear-scrap vinegar, and froze five ice cube trays of pear sauce to use in blender ice cream.